Once again I arrived home after work only to realize that I had not taken anything out of the freezer for supper. Dang it. 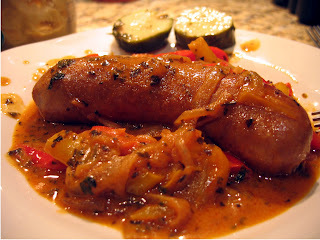 But a quick defrost of some Italian sausages and two peppers in the veggie drawer offer up a good, quick option. 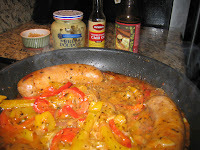 As the slicing of the peppers started, my initial thought was to do a basic Italian version of sausage and peppers; but when I opened the fridge to get a beer (for drinking purposes)- my hand passed by a big jar of Dijon mustard. My mind started to whirl with visions of German steins of beer, plates of Oktoberfest bratwurst and lederhose! Beer and mustard - two of my favorite things! So away go the tomatoes and in goes the mustard. I had already committed to the basil, and it worked fine; although if making this again I would probably substitute thyme instead. And the same goes with the sausage - I just happened to have the Italian sausage, but anything would work here. This is simply sensational, a great change from the classic Italian sausage and peppers, which is good in its own right. The sausages stay nice and moist and the sauce cooks down to a thick, creamy, yummy mess. I served this with a couple of big hunks of homemade pickles - soo good! It's important to get a good beer; throw in a pretzel for an appetizer and you'll be seriously fat and happy! Prost! 1/2 bottle of beer- I used New Belgium 1554 Enlighted Black Ale- it's a fabulous dark beer, choose any micro beer, just don't go with some sort of silly light. Simmer until sausage are done. Serve with big crusty dog buns or just a hunk of bread on the side to sop up the sauce with; don't forget the pickles and serve with a glass of the beer you used too!